There are many users complaining about an error “Entry point not found”, this issue generally start appearing after updating to Windows 10. It pops up when user try to run any application. The error “Entry point not found”, in most cases, block or abrupt an application, so the related application may or may not run successfully. The “Entry point not found” error can affect all the installed applications and programs and can start popping up after a fix time of interval. “The procedure Entry point? Initialize @CLASS_DESCRIPTOR@@QAEEXZ could not be located in the dynamic link library. Computer malware and virus are one of the two most common causes of the “Entry point not found” error, these both causes may affect or damage or corrupt the system file. 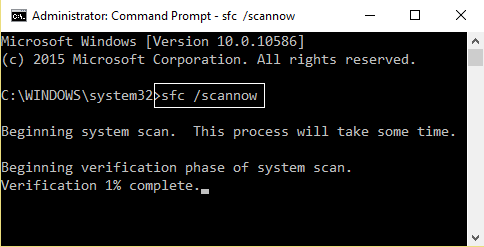 In order to fix the virus or malware and get rid of “Entry point not found” error, you should download Microsoft Safety Scanner and use this app to scan your computer and get rid of any and all viruses or malware. If you are unable to solve the “Entry point not found” error after applying the above given solution then don’t worry and apply this one. It is clear that you are suffering from this issue because of a system file that has been damaged or messed around with by you or by some kind of malware or virus. To repair system file you should try an inbuilt System File Checker to scan all corrupted system files and fix Find.exe Entry point not found error. This command will verify for damaged system files and repair them, and this should get rid of the “Entry point not found” error. 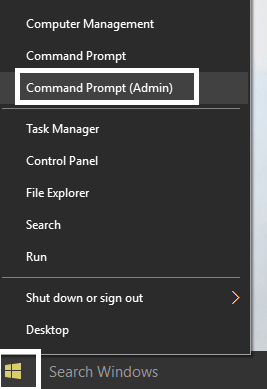 Also Read: [Manual & Automatic] How to Fix “…\windows\system32\config\system is missing or damaged” in Windows 10? The system restore feature of Microsoft is completely a lifesaver for Windows 10 system users who are suffering from such kind of issue. 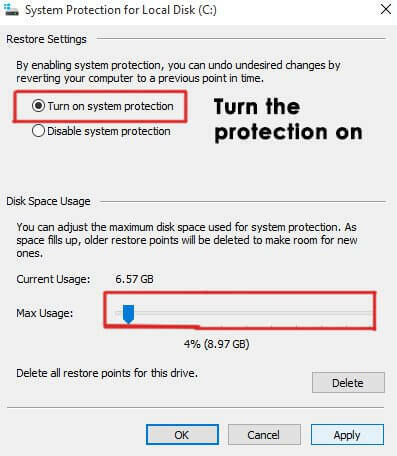 This feature allows you to turn back the clock and then restore the system to system restore point that was created previously. With this, it restores everything from the program that have already installed on your system to your settings as well as preferences. 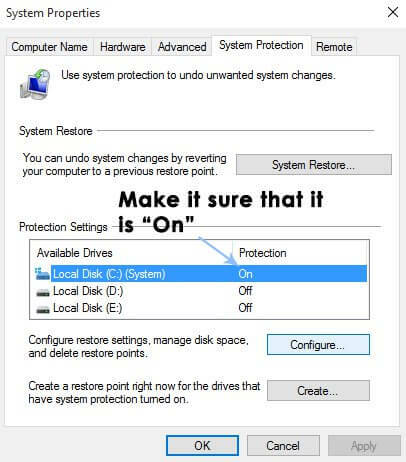 Restoring your system to a System Restore Point before getting “Entry Point Not Found” error will definitely fix the issue and it will take just 15 minutes to complete the procedure. 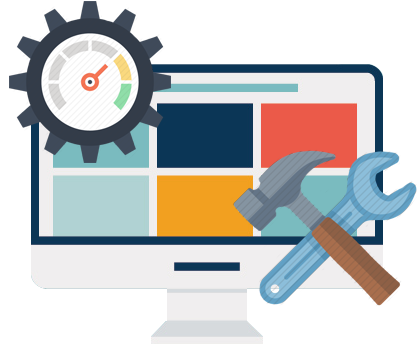 Here, you will know the steps below to restore your system to a version without any error. 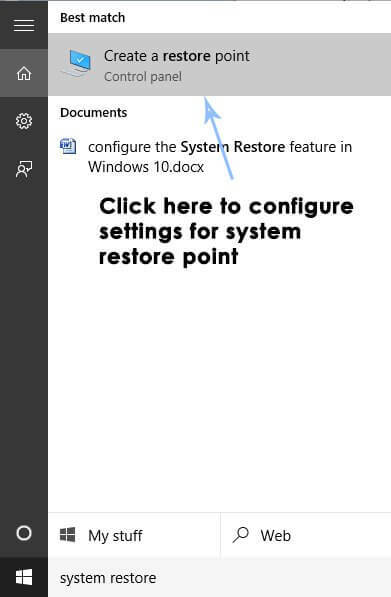 Step 1: First of all, you need to search for System Restore using Cotana in the Windows 10 system. Now click on Create a restore point from there. Step 2: A System Properties will then appear containing the settings for restore point. Now, navigate to Protection Settings inside the properties. Here, make sure that the protection is enabled on the Local Disk C.
Step 3: If the protection option is disabled then select that disk and then click on Configure button just to enable the protection. Also, you should allocate the maximum disk space for system protection. After this, try to set it over to values you want. For this, you have to click on Apply and then OK to apply the settings. Step 4: After this, the system will create a restore point automatically when an alteration happens inside the Windows. 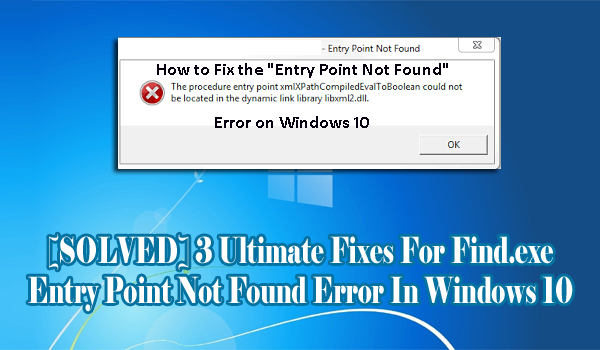 While using Windows 10, if you notice that you get “Find.exe Entry Point Not Found” error then you can try the above mentioned three manual solutions. All these solutions will definitely help you fix Find.exe Entry Point Not Found error. However, if you find that all these manual solutions do not work then you can try third party tool, PC Repair Tool. This tool allows you to resolve Find.exe Entry Point Not Found error. 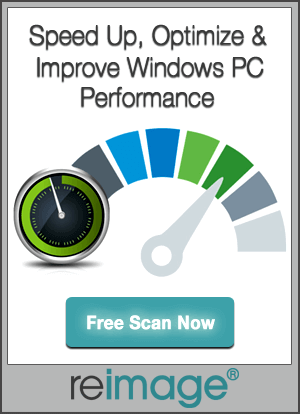 With this tool, you can fix any kind of error you get in your Windows system. This tool can also fix all kinds of DLL errors, runtime errors and more. Just try this tool and fix all your issues with an ease. Try these three manual methods to fix Find.exe Entry Point Not Found error. Do not miss all these to resolve Find.exe Entry Point Not Found error in Windows 10.